12667: Eversharp Skyline: rare early-production slender Demi model, burgundy lever-filler with red pearl striped cap, 12.3 cm long, gold filled trim, section with ink window. Parts will not exchange with later Skylines of any size, which are all of greater girth. A little-known variant -- read more about it here. 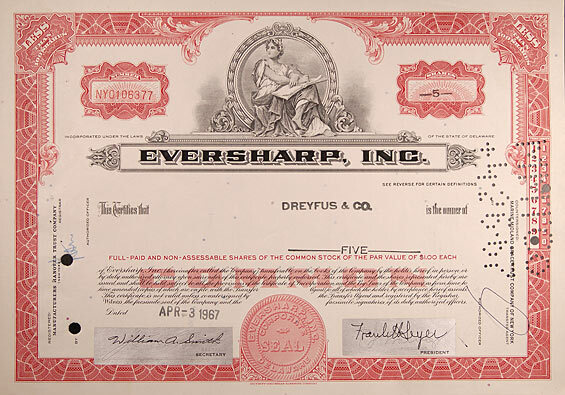 12582: Eversharp Skyline: dark burgundy lever-filler, 13.35 cm long, gold filled trim, doubly rare with ribbed sterling silver cap -- the rarest of all Skyline caps -- and Wahl markings instead of Eversharp (nib, top ring, and clip, with "W" logo in place of double check mark). It has been suggested that a small number of Skylines were so marked in order to maintain trademark protection for the Wahl name, but this is still speculation -- though the rarity of these pens is well-known. 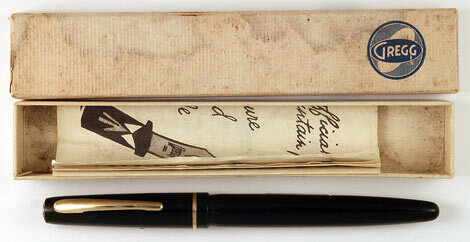 11347: Eversharp Skyline: black full-length lever-filler, 13.2 cm long, gold filled trim, uncommon configuration with ribbed plastic cap; name on barrel. 12550: Eversharp Skyline: black streamline lever-filler, 13.3 cm long, 14K solid gold cap and derby, smooth wet nib. Cap has a few minor marks and an area with stress cracking, apparently a manufacturing defect, hairlines also on sides of clip (see details), none of which affect function. 11841: Eversharp Skyline Executive: rare oversize lever-filler, burgundy with striated red and pearl cap, 14.1 cm long, gold filled trim. 13822: Eversharp Symphony: dark green lever-filler, 14 cm long, chrome plated cap, gold filled trim, soft and flexible nib. 13432: Eversharp pump-filler: unusual black French-market model, 14.25 cm long, gold filled trim; the only parts at all in common with USA-production Eversharps are the Skyline-style feed and nib. The nib, however, is 18K gold and French-hallmarked, and the filling system with the accordion sac is characteristically French. 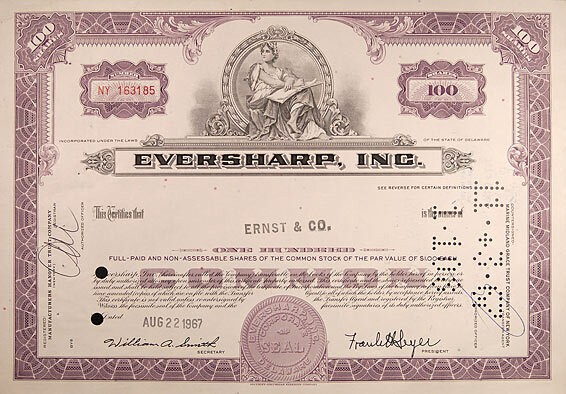 9517: Eversharp stock certificate: several available, 30 x 21 cm, each for 100 shares, various dates between 1960 and 1967.